Not so much break for the border today and more of a case the border is broken. Chile is on strike, the border and customs officials at least. We got the news over dinner last night and woke this morning to the realisation that it was true. A large South American spanner had been well and truly thrown into our works. Necessity though they say is the mother of invention and overnight the Organisation had been busy, hotels had to be changed. Routes redrawn and instructions reprinted. Kim Bannister and Anthony Preston worked into the night to put together an alternative rally schedule. We did salvage something from today though. There's a race circuit at Esquel only 4km from the hotel so at first light we made our way there for a couple of Time Trials. This circuit wasn't as tight as the track we were on yesterday so there was more of a chance to open the taps and give it a go ..... before closing the taps, stamping on the brakes and heaving the steering wheel around. As is the way with Endurance Rallying your rivals are also your friends and travelling companions and as the cars made their way round the track the rest of the Rally gathered in the rickety old grandstand to cheer them on and offer friendly and well chosen words of advice. The big open top Mustang of Christian and Regine Dumolin scorched around with squeals of what we presume was delight from his tyres. 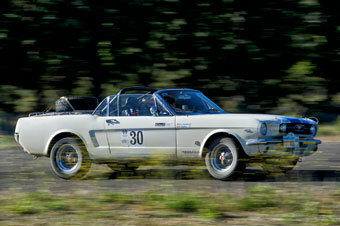 And the the big closed top Mustang of Jan van Gemeert followed in similar fashion. The Coupe des Dames category of Catherine Janssens d'Andrimont with her daughter alongside also put in a respectable time despite having trouble selecting gears. 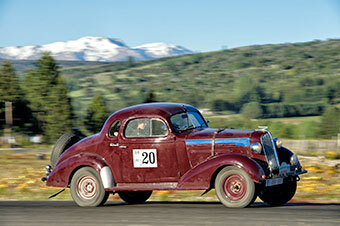 At the end of the session it was Chuck and Pamela Lyford who took the chequered flag in the Vintageants. There was trouble at the end though for car 15 which we found in the pit lane sitting in a pool of water. 'It's and old car and it's incontinent' was the verdict of the crew as the sweeps mixed up some resin to plug the leaking radiator. This remedy soon had them back on the road and they made good time to the night halt. Once this little escapade was over and done with we hit the highway, for the non stop trip to Los Antiguos. For the rest of today the had Rally turned into a road trip and secretly some of the crews were looking forward to it. With their flying jackets well zipped up against the chill a convoy of Vintageants hurtled South. Not too much dust, very little gravel no problem. This was a chance to kick back, take in the views and relax a little without the time card nagging. Some of us gathered for an impromptu mid morning stop at the service station in the small town of Gobernador Costa where we reckon they sold more empanadas today than they would usually do in a whole week. Tanks filled and crews refreshed we pulled back onto the highway through a cheering crowd of school children who's teachers had brought them across to meet us. Much of the day was spent on a high plain at around 800m. There was water but by and large it was a dry and parched landscape. David and Julia Harrison have made such good progress in the Porsche 356 so far marvelled at the vastness of it all. When you stopped by the roadside and turned off the engine there was nothing but the wind. 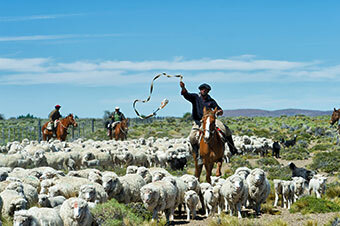 The road ran along a flat valley with a few cattle but many more sheep and we saw three mounted gauchos rounding them up with calls, whistles a few dogs and a rattling plastic bottle. The rebaño moved along steadily but it looked like it was going to be a long day in the saddle. A small fishing party formed on and around a bridge over the Rio Mayo, Nigel Gambier and Hugo Upton parked their Lagonda and led the charge landing a tiddler or two with an unusual Zimbabwean fly but we had to move on before the real action started. We still had 200km to crunch with some of it on gravel and as the afternoon warmed up we noticed the road disappearing into a heat haze in front of us. Mirage or mountain? The horizons turned to liquid as they shimmered, shifted and changed shape all around us. Our destination for the night, the town of Los Antiguos, sitting on the shore of the Lago Buenos Aires is noted for its soft fruit growing and for being windy. So far we've not tried any of the former but can attest to the latter. The Rally was split tonight across many hotels and guest houses. There wasn't one hotel big enough to take us all at such short notice but tomorrow night we regroup at the lakeside Hotel Mora. We'd already gone to press last night when the news arrived that it was Charles Menteth's birthday so a belated happy birthday to him. Today hasn't been the day he would have wished for however. The engine trouble that has dogged his Vauxhall for the last two days reoccurred today and although he did make it to Los Antiguos it was on the end of a tow rope. Fortunately tomorrow is a rest day and he's determined to get to the bottom of the problem.